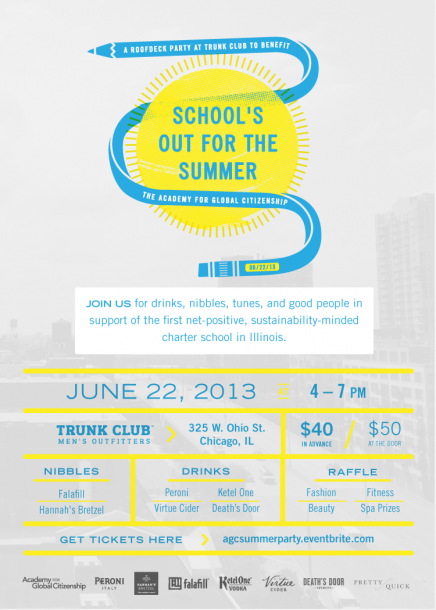 Join us on Saturday, June 22, from 4-7pm at Trunk Club for the rooftop party to celebrate the beginning of summer. We’ll have an open bar with beer and summer shandy from Peroni, cocktails from Ketel One and Death’s Door Spirits, and nibbles from Hannah’s Bretzel and Falafill. Take a break from the summer sun with a cooling neck massage from Chicago beauty startup Pretty Quick. And don’t forget to enter into our raffle while you’re there, where we’ll feature awesome spa, fitness, and fashion prizes!